When talking to people outside of ringing circles the questions we often get asked are: How many bells are there? Which bell do you ring? It's all mechanical isn't it - don't you finding it boring just pressing buttons? In terms of how many bells there are - it depends on the tower! Most churches with bells have six or eight bells, but some such as St Laurence in Reading have twelve. St Giles has eight bells, and once you've learnt how to handle a bell you can ring any one of them. However, a person can only ring one bell at a time, so you need at least eight people to ring at St Giles on a Sunday morning. The only mechanical part of bellringing is the bearings holding the bell in the tower - everything else depends on people power! In fact there's a lot of skill making the bell you're ringing chime at the right time! St. Giles has an active band of ringers. We ring regularly for Sunday service and practice, as well as quarter peals and even the odd peal. 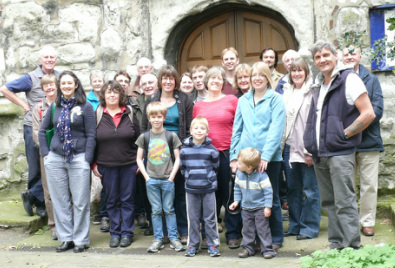 In 2007 we rang the 100th peal on the bells. We usually have two outings a year, one of which is a day trip and the other a weekend trip which allows us to venture further afield. We are a band of mixed ability so practices consist of rounds and call changes to spliced surprise major – and everything between. Visitors are very welcome. If you're interested in joining us please contact Steve Bennett, our tower captain, on 0118 947 7126 or Joyce Vernon on 0118 947 4281. Our practice night is Wednesday from 7:30pm to 9pm, after which refreshments are often taken, and we ring on Sunday mornings before Parish Mass from 9:45am to 10:30am.